The founder of the Milky Way Federation "sits by an image which she claims is the reincarnation of cosmic aliens. Photo: Courtesy of the official Sina Weibo account of the China Anti-Cult Association. 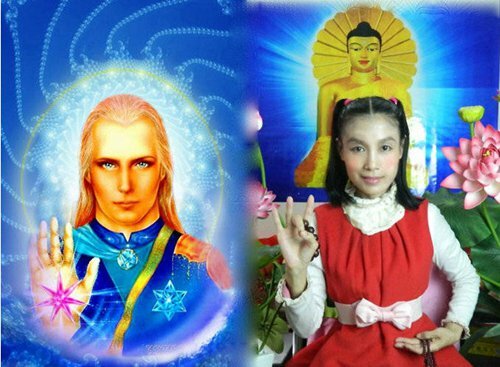 A Chinese astrophysics PhD student has embarked on a solo online campaign to expose what he said are cult-themed social media accounts that promulgate the idea of enlightenment through contact with aliens. Liu Boyang, an astrophysics PhD student under the National Astronomical Observatories of Chinese Academy of Sciences, exposed on Tuesday dozens of social media accounts, including one called "Xingkong Diantai" or in English "Galactic Radio Station." The WeChat account featured a series of speeches made by Ma Xiaoxiao, a woman who claims to be an Australia-based lawyer and member of the World Chinese UFO Association. Ma introduced her experience of coming into contact with aliens in a series of 11 speeches that are available for download on Youtube and the Chinese audio website ximalaya.com. In one of Ma's speeches, she claimed that the spirit of Gautama Siddhartha, or the Buddha, had paid her a visit while she was shopping for chocolate in Sydney, Australia. She also claimed to have come into personal contact with other prominent spiritual figures in Buddhism, such as Guanyin Bodhisattva. Liu said in his online article that Ma's speeches are "brainwashing" in nature and that Ma was trying to establish herself as a prophet-like figure through her speeches, essentially paving the way for her to start a cult and recruit believers. In December 2018, Ma allegedly spoke to an audience of 600 people in Beijing and Shanghai on how to achieve enlightenment through contact with aliens, according to the Galactic Radio Station. Liu warned that Ma had come dangerously close to developing offline believers through "planned propaganda." Ma could not be reached for comment as of press time. However, after Liu's article went viral online, the Galactic Radio Station's account posted a response from Ma on Thursday in which Ma claimed that she is only an alien enthusiast and denied that she had deified herself or developed or controlled any group. Ma said Liu's article had smeared her reputation and that China is a country under the rule of law and she reserves the right to take legal actions. In an interview with the Global Times on Friday, Liu shrugged off Ma's threat of lawsuit, saying, "China is indeed a country under the rule of law, so I hope she will not hide overseas, but return to China to face legal judgment." Liu's article also exposed dozens of other social media accounts on Sina Weibo, WeChat and ximalaya.com that advocate either "awakening through extraterrestrial contact" or hypnosis healing through "past life regression." Some of the hypnosis practitioners have used the accounts to profit, including selling courses or services. Other social media accounts Liu had exposed lie more in the management grey zone. One of the accounts that calls itself "Awakers" on Sina Weibo has over 835,000 followers. The account frequently shares information on alien activities or extraterrestrial civilizations. The account denied on Tuesday having anything to do with the alien-themed cult groups. However, Liu replied on his own Sina Weibo account that "although these accounts could not be labeled as cults, they help sow the seeds and cultivate the environment for alien cults to flourish in China." In November 2018, the official Sina Weibo account of the Chinese government's anti-cult office warned of a cult group in China that called itself the "Milky Way Federation." The office said the cult group advocates doomsday theory and has anti-government tendencies. Extraterrestrial-themed cult groups can be extremely dangerous. In 1997, 38 members of the "Heaven's Gate" religious cult in the US, led by Marshall Applewhite, committed mass suicide believing they could leave their bodily "containers" and enter an alien spacecraft hidden behind the Hale-Bopp Comet, reported CNN.